Mattel has developed a reputation for absolutely screwing over fans when it comes to their summer con exclusives. It had been getting progressively worse for years, and all came to a head with 2009's Wonder Twins and the colossal screw-up that went along with them. This year Mattel took Rustin's suggestion, and offered pre-sales through their website, and while that leads to some obvious problems of its own, overall things were better this year. During a botched robbery in 1941, Patrick "Eel" O'Brian was shot and fell into a vat of acid. The chemicals seeped into his O'Brian's wounds and altered his body. He discovered that his flesh could stretch into any shape he imagined. 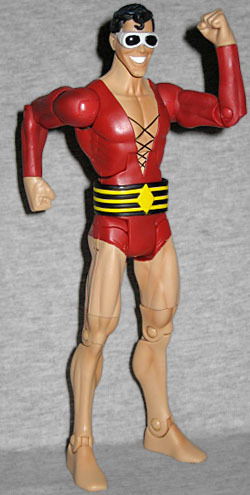 Reforming his wicked ways, O'Brian became the hero known as Plastic Man. It's unusual that they'd work the year the character was created into his bio, but in a way, it kind of makes sense: after all, if those chemicals so drastically changed his physiology, who's to say he'd age like a normal person? Or age at all? It's entirely possible that his accident really did take place in the 1940s, and he's been goofballing his way around the DC Universe since World War II. He just kept a low profile all that time. He's one of those characters DC tries to give a push at least once a decade, but it never takes. His biggest claim to fame is filling the trickster archetype in the pantheon of Grant Morrison's JLA - and that was in the late '90s! Plastic Man is one of those rare DCUC figures to get a new sculpt, but if what we saw at SDCC is true, that's one area in which Mattel will be improving. Plas has a very skinny body, which is appropriate for him - he's not a heavy bruiser, and this body is actually thin enough to be distinguishable from the other ones DCUC uses. That's more than you can say for the differences between their "large" and "small" builds, that's for sure. 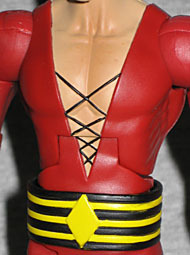 His costume elements are sculpted on, including the fine black straps crisscross his chest. There's a noticable difference in the "costume" areas vs the "skin" areas, which is the kind of thing that makes the usual reuse so frustrating: we know the Horsemen can do awesome, subtle things like that, but Mattel constantly hamstrings them. There have also been quite a few complaints about the figure's feet: that they're just pink-painted boots. Well, yeah, they are - that's what his feet look like in the comics. Apparently people were expecting individual toes, but that would have been wrong. 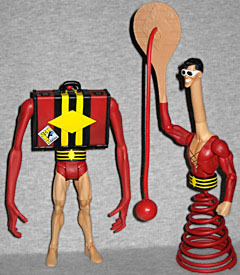 Plastic Man's head is great. In the comics he always looks like a cross between Superman and the Joker, and the toy doesn't change that. Like Superman, he has black hair and a spitcurl on his forehead; like the Joker, he has a narrow, pointed chin and a huge smile. Add to that his trademark white goggles, and you've got a winning recipe for Plas. He looks terrific! If I were to change anything, it would be his hair: make it look a little less natural, and a little more... plastic? Articulation is exactly what you'd expect, with no surprises. He moves at the neck, shoulders, biceps, elbows, wrists, waist, hips, thighs, knees and ankles. But articulation was never this figure's selling point; no, his claim to fame is his assortment of accessories. See, what sets Plas apart from other stretchy heroes is that he's more flexible, if you'll forgive the pun. 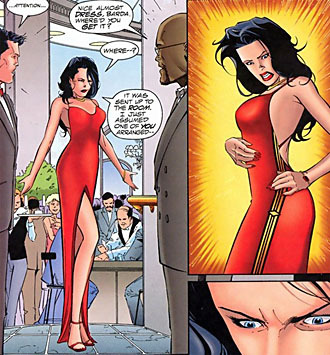 Most rubberband characters just stretch really far - Plastic Man is able to actually change into different forms: a kite, a vending machine, a giant jack-in-the-box... even, in one memorable case, into Big Barda's dress. So he needs more than some long arms to be complete. 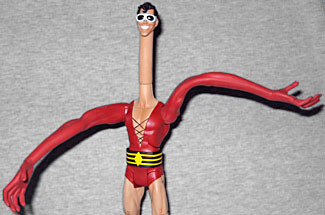 Plastic Man has some long arms. They're pure red, and jointed only at the shoulder, due to the fact that they're molded from a nice stretchy rubber. Not Stretch Armstrong "filled with corn syrup" stretchy, but "this is a solid chunk of rubber" stretchy. They can be pulled to at least twice their original length with no problems. He also has a 1¾" neck extension, which is another fairly standard offering. It's slightly bendy, and has ABS clips in both ends to accommodate the head and neck pegs. One warning, though: the neck is insanely hard to get off the figure once it's on, so be ready for a struggle. Okay, those are the mundane parts. Let's get wacky! In addition to his arms pulling out at the shoulder, his hands pull off at the wrist. His replacement hands are a large fly swatter, and a (semi-)working paddle ball. The ball and its "string" are one molded piece of rubber, so theoretically you could bounce it like the real thing, but in practice it doesn't really function. Oh well, no loss. He also pulls apart at the waist, and his legs can be replaced by a spring - a real, honest-to-goodness metal spring coated in plastic to blend in with the rest of the toy. To keep the arms tight in their sockets, Mattel's created a clever little system: they don't just pop in and out, you have press a button on his back that slides small tabs forward and releases the pegs so the arms drop out with no trouble. Just like last year, there's an extra accessory available to people who got this exclusive in person at San Diego. Unlike last year, though, it's not a fundamentally important part of the set. To show his shapeshifting abilities, attendees got a polybagged suitcase. It's red, yellow and black, just like everything Plas turns into, and has spots to attach arms and the head (the suitcase handle serves the same function as the button on the figure's back). The CCI logo is stamped on the lower corner of the front, and the lid opens. 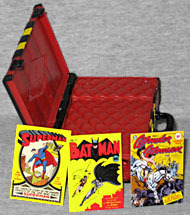 Inside are three in-scale reproductions of classic DC comics covers: the first issues of Superman, Batman and Wonder Woman. Apparently he's been shopping! The inside is sculpted with a padded texture, as well. Mattel's site describes them as "chip art," but whoever chose that term doesn't understand what it actually means. 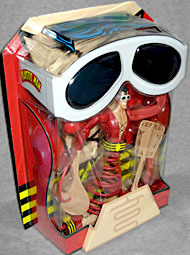 Even Plastic Man's packaging merits a mention. It's the same shape as the standard DCU uber-blisters, but definitely not the same design. The entire thing - front, back, top, sides, even the inserts - are designed to look like Plas imitating action figure packaging. That's really clever! It goes even further, though: the top has an insert designed to look like his hair, and there's a real pair of "Plastic Man goggles" you can wear. Outstanding! 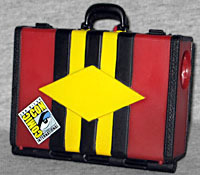 The set also includes a manilla folder with Plastic Man's DEO file (Department of Extranormal Operations - the government agency that oversees metahumans). The file includes two double-sided reports classifying who Plas is and what he does. A figure coming with reproduction documents from a shadowy government agency? Wow, that Mattel - always innovating! The file says he was last spotted in San Diego, and agents should be on the lookout for anything unusual - such as a toy package wearing goggles. Plastic Man is a surprisingly complex character: he's basically a Marvel guy in a DC Universe, a flawed character with complex motivations and history that keeps on trying to do his best despite the odds. His japes would drive even Deadpool and Spider-Man nuts - think of him as half Dane Cook, half Johnny Knoxville (both guys who would be awesome playing him if the Wachowski brothers should ever get their Plastic Man movie off the ground). 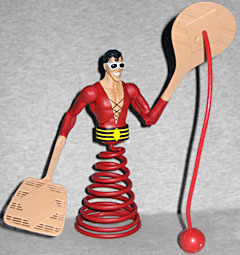 This is the best Plastic Man figure ever made, a fun addition to the DCU Classics line. And this year, if you can't get the extra piece, you're not missing out on anything vital.